Is a second UN resolution needed to authorise military action? Britain and the United States could soon be at war with Iraq. But will it be legal? Experts on international law have conflicting views about the rights and wrongs of any military conflict. Some believe that the use of force would be justified under existing UN resolutions, so another vote is not needed. But others argue a second resolution may not even provide the legal authority for military action. 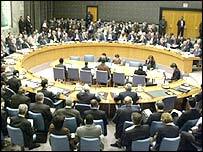 A group of 16 academic lawyers have questioned the validity of an attack on Iraq under UN resolution 1441. The letter, published in The Guardian newspaper, said use of force would only be justified in self-defence to armed attack or if a new resolution on force was passed. Others have even posed a startling question. 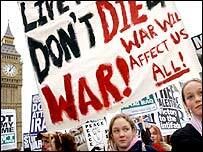 Could George W Bush and Tony Blair one day find themselves facing criminal charges for going to war against Iraq? A British academic, Professor Nicholas Grief, says this is not as far fetched as it may seem. He cites the Nuremberg charter of 1945, which established the concept of a crime against peace. 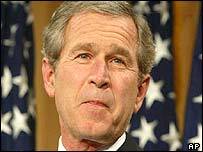 Could George W Bush be held to account for attacking Iraq? "There is a school of thought that going to war without the express authority of the Security Council would violate the UN charter," says Professor Grief. "That could raise serious questions about the personal responsibility of President Bush and Mr Blair, and they could have a case to answer. "They could be held to account in years to come. It is something they ought to be concerned about." 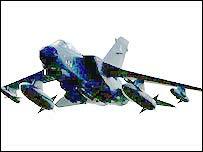 Professor Grief, who is head of the law school at Bournemouth University, says there would be a further risk if US and British forces failed to make a proper distinction between military targets and civilians. Colin Warbrick, Professor of Law at Durham University, agrees that the possibility of criminal charges should be taken seriously. "It could apply to military commanders in the field, as well as civilian leaders," he says. "Initially, it would be up to the British Government to investigate any allegations, and bring cases under British law. But if that failed, the International Criminal Court would have jurisdiction." The US president and the British prime minister are hoping that if a second resolution is passed, it will justify their tough stance against Saddam Hussein. Can an attack on Iraq be justified as self defence? But some legal experts believe the need for a new vote is purely political, and not necessary in law. Professor Anthony Aust was until recently one of the top legal advisers at the Foreign Office. He says previous resolutions allow the United States and Britain to use military action to restore peace and security in the Gulf region. "There are strong legal arguments for saying that the Security Council has already authorised the use of force," he says. "A second resolution may be very desirable politically, but there is sufficient authority in Resolution 1441 for military action." But in sharp contrast, Professor Grief argues that previous resolutions are no longer valid, and the use of force against Iraq now would have to be expressly approved by the UN. "Even the Security Council does not have a completely free hand to authorise military action," he says. "Force is only to be used as a last resort, when efforts to resolve conflict peacefully have been exhausted. You have to say, hand on heart, that we are not at that stage." The complexity of the legal and political issues is highlighted by David Armstrong, Professor of International Relations at Exeter University. "It is awfully murky," he says. "If a second resolution is voted against, or vetoed, the legal ground looks a bit shaky. "But I think the Americans want it to protect Mr Blair. They are worried because he has made himself so vulnerable." The use of force can be justified under the UN charter as an act of self defence. But Professor Grief argues that it does not apply to the present circumstances. "There has been no use of arms against the United States or the UK, or the imminent threat of their use," he says. Professor Warbrick agrees. Not only is there no imminent threat from Iraq, he says, but the UK Government has not demonstrated a link between the regime in Baghdad and any terrorist group who might pose such a threat. Without a second resolution, he says, it would be unlawful for the UK to use military force against Iraq. He warns that if those who rely on previous resolutions are right, it will provide an open-ended power to achieve regime change. "Authorisation by the Security Council for action needs to be explicit," he says. "The draft resolution does not contain the authority to use force, neither does Resolution 1441. "Resolution 1441 does talk about 'serious consequences' for Iraq, but the decision on what that means should be reserved for the Security Council. "It should set precise mandates, time limits, and a mechanism for accountability."